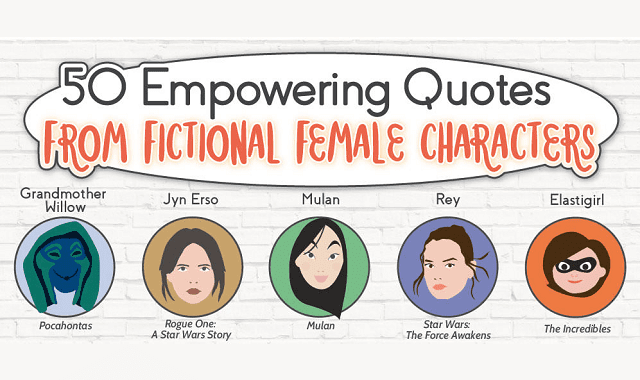 50 Empowering Quotes from Fictional Female Characters #Infographic ~ Visualistan '+g+"
This is an awesome collection of motivational quotes from female superheroes, Marvel characters, Disney characters, video game characters, comic book characters, literature characters, and so much more. While there are countless strong, unique, and influential women in the real world to guide and motivate, it is always fun to look into fiction for more sources of inspiration. Female superheroes such as Wonder Woman are finally receiving well-deserved recognition, showing that independence, strength, courage, and fierceness are commendable traits in women and society as a whole. On this chart, you will find quotes about life, independence, individuality, determination, strength, courage, and love. Some of funny, some are striking, and all of them offer a gem of wisdom that people of every age, gender, and background can find value in. There are lots of beloved and iconic faces on here, but also some lesser known characters to help you discover new sources of entertainment and inspiration.